This entry was posted in Campus Announcement, General News, Research and tagged hospital, small animal on April 27, 2011 by Wire Eagle. AUBURN – The Board of Trustees of Auburn University has approved the naming of the future small animal teaching hospital for a former graduate of the College of Veterinary Medicine and his wife. The Wilford and Kate Bailey Small Animal Teaching Hospital will be built adjacent to the existing hospital on the college’s campus. Auburn alumni John and Rosemary Brown have made a $10 million pledge in memory of the Baileys. The Browns are contributing the funds in admiration and appreciation of their friendship with the Baileys which began when they were students at Auburn during the 1950s. “Through their gift, John and Rosemary Brown are challenging friends and graduates of our college to match their pledge,” said Dean Timothy Boosinger. “Their support creates awareness of the new small animal teaching hospital and encourages others to contribute. Wilford S. Bailey, a veterinary parasitologist, held a 50-year continuous faculty appointment at Auburn University after receiving his veterinary degree in 1942. He served in positions ranging from instructor to university president. Bailey was the first recipient of the Auburn University College of Veterinary Medicine’s Distinguished Alumni Award. After his death in October 2000, the award was renamed the Wilford S. Bailey Distinguished Alumnus Award to acknowledge his contributions to veterinary medicine, higher education and humanity. Bailey met his wife Cratus “Kate” Hester during her one quarter at Auburn after she had earned degrees in home economics from Nashville’s David Lipscomb and Peabody colleges. The couple married in 1942. At the time of Bailey’s death, they had been married 58 years and had four children: Ed Bailey of Rye, N.Y.; Joe Bailey of Auburn; Margaret Bailey Newcomb of Palmyra, Va.; and Sarah Bailey of Acworth, Ga. Kate Bailey died August 5, 2010. John Brown, a 1957 graduate in chemical engineering, retired as CEO of Stryker Corporation in 2004. His wife Rosemary Kopel Brown graduated in 1957 in chemistry and spent 30 years as a secondary mathematics teacher. The Browns are longtime supporters of their respective colleges and the College of Veterinary Medicine. The Dr. Wilford S. Bailey Scholarship, funded by the Browns and given annually, provides resources for veterinary students. 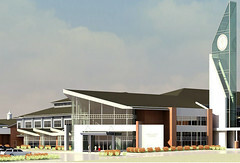 The Wilford and Kate Bailey Small Animal Teaching Hospital is scheduled to open in 2014. The new facility will feature approximately 200,000 square feet of clinical, examination and client-use space. The hospital will include services such as community practice, critical care, oncology, neurology, imaging and orthopedics.